Milpa cultivation involving cutting an area of forest, burning, and planting crops has existed in the Yucatan Peninsula for more than three millennia. Fallow periods are short and decreasing, leading to a productivity collapse of the system. Technologies that increase yield and maintain plots under cultivation have the potential to decrease the land area needed for family food production, resulting in more mature forests. Management practices are needed that increase yield in the first year of cultivation, and maintain yield with continued cultivation. Obvious solutions for achieving these outcomes, considering the hypothesized limitations from weed competition and nutrient depletion, are herbicides and fertilizers. 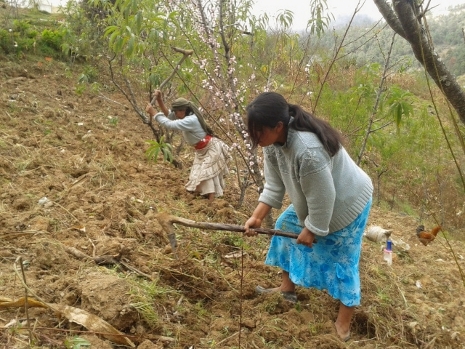 In milpa, weeds and pests were traditionally controlled manually; however, pesticide use has become more common. For any cultivation year, labor requirements were much greater for hand control than for chemical control. …If chemical control can be implemented effectively it represents an opportunity for farmers to reduce labor input, and continue to cultivate the same land for a longer period. At harvest, herbaceous weed cover was much less following chemical control than with hand or no weeding and with chemical control, there was no increase in weed pressure between cultivation years suggesting that chemical weed control could enable cultivation of the same land for an extended period. …with hand weed control, grain yield declined with continuing cultivation while grain yield did not decline with continuing cultivation when chemical control was implemented. This suggests that maintaining weed control through chemical application benefits the crop throughout the growth cycle. The study suggests that both enhanced weed pressure and declining fertility are important factors for yield decline in milpas. Chemical weed control required much less labor than hand weeding, effectively reduced weed cover, and increased grain and biomass yield. Grass weeds were not problematic in the first year of cultivation. However, continued cultivation led to problems such as yield decline unless chemical control was used. Authors: Parsons, D., et al. Affiliation: University of Tasmania, Australia. Title: Managing maize production in shifting cultivation milpa systems in Yucatan, through weed control and manure application. Source: Agriculture, Ecosystems and Environment. 2009. 133:123-134. This entry was posted in Herbicides and tagged Milpa, Milpa Cultivation, Yucatan Peninsula by pesticide guy. Bookmark the permalink.